A long barrow is a prehistoric monument usually dating to the early Neolithic period, traditionally interpreted as a collective tomb. 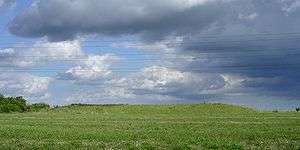 They are rectangular or trapezoidal tumuli or earth mounds. Long barrows are also typical of several Celtic, Slavic, and Baltic cultures of Northern Europe of the 1st millennium AD. A well-preserved earthen long barrow on Gussage Down in the Cranborne Chase area of Dorset, U.K.
50% of the long barrows in Gloucestershire, 66% in Hampshire, 80% in Lincolnshire and almost all the burial mounds in Essex have been damaged. According to English Heritage modern tillage techniques have done as much damage in the last six decades as traditional tilling did in six centuries. Grans Barrow on Toyd Down, Hampshire, U.K. 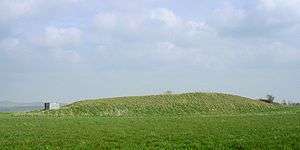 The long barrow mound is 60 metres long, 20 metres wide and over 2 metres high. The function of long barrows is not known. They contain bones of many individuals, which often show evidence of regular moving around or sorting. It appears they were accessed regularly, not just to inter newly deceased bodies but also to make use of the old bones there. Possibly bones were taken out of the barrow for some purpose and returned later. Some authors speculate that this was part of an ancestor veneration practice, perhaps similar to the present-day Famadihana tradition found in Madagasgar. Grønsalen on the island of Møn, the largest long barrow in Denmark. Ashbee, Paul (1984). The Earthen Long Barrow in Britain: An Introduction to the Study of the Funerary Practice and Culture of the Neolithic People of the Third Millennium B.C. Geo Books. ISBN 0-86094-170-1. Darvill, Timothy (2004). Long Barrows of the Cotswolds and surrounding areas. Tempus Publishing. ISBN 0-7524-2907-8. Hogan, C.Michael (2008). Catto Long Barrow. The Modern Antiquarian. .
Lynch, Frances (1997). Megalithic Tombs and Long Barrows in Britain. Shire Publications Ltd. ISBN 0-7478-0341-2. Long barrow search results from Megalithic Portal.